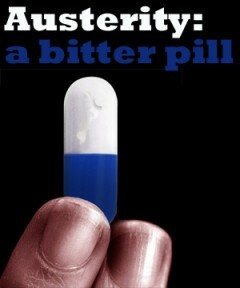 Does anyone seriously believe swallowing Tory austerity measures makes Labour credible? There seems to be a plague going round the Shadow Cabinet, which is quite catching, the symptoms of which appear to be seriously muddled economic and political thinking. After several comrades went down with this malady over the New Year period, the bug appears to have re-surfaced again, to judge by yesterday’s remarks from the foreign affairs spokesman as reported by Guardian political journalists who seem intent on transmitting the disease. Apparently despite having committed the party (without any consultation or debate) to retaining all the Tory cuts and accepting the Tory pay freeze to 2020, we still need to talk “a lot more” about bringing the deficit down. He insisted that just because Conservative austerity economics failed, Labour would not become credible – to become credible, Labour needs to adopt the same kind of austerity policies as the Tories. Make what you can of that. He accepted that a stimulus was needed to get the economy moving, but then seemed to be under the delusion that Labour had won that part of the argument. It certainly hasn’t. Accepting all the cuts – that is, a reduction of expenditure of £109bn – plus a decade of pay freeze makes it quite clear that Labour concedes the Tory position that the economy isn’t going to get moving any time soon. It is extraordinary that these remarks have been made just a couple of days after it was officially announced that the UK economy is now contracting, almost certainly already in the grip of a double-dip recession. He also insisted that Labour would support a cap on household welfare benefits (though not a cap on the excesses of corporate pay, like Hester’s £0.96m bonus) provided “it should not render people homeless”. But that is exactly what capping household welfare benefits will do. Expert assessments estimate that the Tory cap on housing benefit will force at least 80,000 families out of their homes. What would the Labour cap be, if not exactly the same as the Tory one, and what would be its effect? The idea that lining up with all the Tory austerity measures will give Labour ‘credibility’ is preposterous. It will hardly even reduce the deficit which is supposed to be the whole object of the exercise because, as Ed Balls has rightly pointed out, even the OBR (that offshoot of the Treasury) admits that rising unemployment, falling national output and lower tax revenues mean that already £157bn more will have to be borrowed by the government than Osborne budgeted for 18 months ago. Perhaps the foreign affairs spokesman should stick to foreign affairs. Why does Labour stick to Tory austerity plans the stats show can’t be achieved? Posted in: Economy, Labour, Macroeconomics, Politics, Public Spending.